Seashell Sal and I have two sons. CrabCake 1 is a junior at the University of Miami in Coral Gables Florida, ( yeah, I know, what a life. ), and CrabCake 2 is a high school freshman. Before CC1's arrival, like most new parents, we spent weeks preparing the house. We painted rooms. We bought clothes. We bought furniture. We bought books and magazines to tell us which paint, clothes and furniture we should buy. We also bought a couple of jars of baby food. We knew that CC1 wasn't going to be needing any jarred baby food for awhile, but in that moment of idyllic preparation frenzy, we decided to pick up some pureed chicken and pureed fruit, just to see what it was like. One day, just before CC1 was to move off formula, SS Sal and I tried some of the chicken. It was vile. It smelled bad, looked worse and tasted like crap. It was at that moment that Seashell Sal decided she was going to make all of CC1's food. It was at that moment that CC1's and CC2's fates were sealed. From then on they would be "picky" eaters. Not picky bad, but picky. Sundays were spent preparing food. All sorts of vegetables were boiled. Countless fruits could be found percolating on the stove. After they had properly cooled, they would be "plopped". Dropped onto cookie sheets or into ice cube trays and then frozen. Once rock hard they were transferred to plastic freezer bags to await consumption. Any leftovers that SS Sal and I had from our dinners would also get the puree, plop and freeze treatment. We had Gerber on the run. Neither of the kids ever ate a jar of baby food. The kids got to be very picky eaters. The kids got to be better eaters than most of our adult friends. As they got older, they never really cared for fast food burgers or those chicken-finger-nugget things that all their friends seemed to love so much. To this day we rarely have pizza, and if we do, CC1 wants it to be topped with basil pesto and fresh tomatoes. CC2 eats sandwiches from home for lunch everyday. Corned beef, cheese and pickle. Pastrami. And, occasionally, mozzarella, pesto and balsamic syrup on toasted whole wheat. Lord save me. The real problem is not the pickiness. It's not the cost or the time it takes to prepare good food. No, it's what do you do about dinner when your coming home late from a practice or a rehearsal and you don't want to wait an hour or so for dinner. Enter soup. Specifically, Desperate Soup. Desperation creates inspiration. 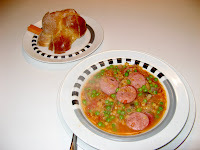 This is my version of a jazzed up lentil soup. Though if you don't have or want lentils it can be made with beans (cannellini are my favorite) or with noodles. This is also a great way to clean out any leftovers in the fridge. With a little bit of advanced planning you too can pull off this meal sized soup in less than an hour. My all time record for preparing this recipe is 40 minutes from walking into the house to sitting down to eat. No time is no excuse crablings. So stop whining and start cooking. Pour the chicken stock and diced tomatoes into a large pot and bring to a rolling boil over medium-high heat. While the liquid is coming to a boil, slice and dice the kielbasa, mushrooms, onion, and carrot. Heat 1 tsp of olive oil in a saute pan over high heat. When hot but not smoking add the kielbasa. Step away from the pan, it will sizzle. 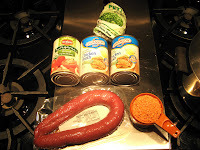 After one minute, toss the kielbasa so that most pieces are turned over. There should be a nice caramelization on the sausage. 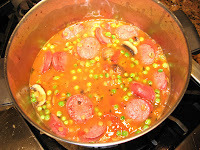 After one minute add the kielbasa to the pot with the liquid. Next, bring the saute pan back up to heat and add the mushrooms. Walk away for one minute and pour yourself a glass of wine. Come back and toss the mushrooms. Walk away for one minute. After the additional minute, add the mushrooms to the soup pot. Return the saute pan to heat and add the onions. Walk away, have a sip of wine. If desired, add the chili pepper flakes to the onions and toss, sauteing for another minute. Add the onions to the soup pot. With the soup boiling add the lentils to the pot and stir, trying to get all the lentils off the bottom of the pot. Turn the heat to medium and have the soup cook at a rolling simmer (a light boil). Stir every five minutes to keep the lentils off the bottom of the pot. After 20 minutes add the carrots and cook for five minutes. After that five minutes add your frozen vegetable of choice and simmer for 5 more minutes. Test the lentils to see if they're done. They should be a little mushy. Adjust salt. You're done. Serve in bowls with a little grated parmensan cheese if you have it (or a squeeze of lemon juice). If you have some crusty bread that's also a great addition. Freeze whatever you don't finish for another desperate night. Alright crablings, a new recipe to try. Clean-Up: Light to Moderate, you can do the knives and cutting boards while the soup finishes, though the soup pot make take some work. Just remember, you can do it. You can cook. Stop whining and start cooking!!! !What a sensible turn of phrase! My children have very little in the way of takeaways, I have discovered it is so often easier, quicker and cheaper to throw something together just like you have here!!! !